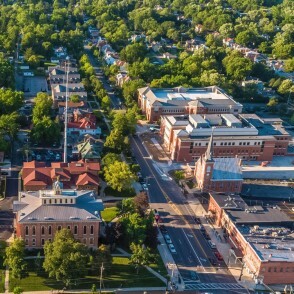 The Delaware Entrepreneurial Center at Ohio Wesleyan University is a first-of-its-kind collaboration among Ohio Wesleyan University, Delaware County, and the City of Delaware creating a business incubator and education center on the OWU campus. The Delaware Entrepreneurial Center at Ohio Wesleyan's mission is to create a collaborative, innovative, and imaginative space that facilitates value creation and professional development. The Delaware Entrepreneurial Center at OWU is housed at 70 S. Sandusky St. and includes rentable office spaces, a shared work area for center members, a conference center with digital meeting capabilities, and educational programming to support entrepreneurial understanding and success. 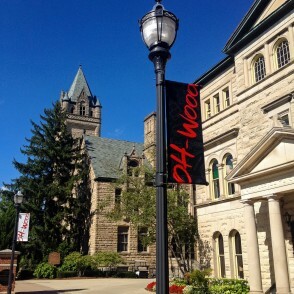 Center members have access to Ohio Wesleyan student-interns, through The OWU Connection, for assistance with product research, marketing strategies, budgeting, graphic design – and other needs to help them build their businesses. The Delaware Entrepreneurial Center at OWU is the nation’s first such collaboration among a small liberal arts university and the surrounding city and county. This entrepreneurial endeavor is designed to ignite creativity! Find YOUR spot to expand your dream! We have unique spaces for entrepreneurs at all stages of their business creation: 5 Offices, 60 Coworking locations, and Conference rooms. The Delaware Entrepreneurial Center will have access to campus resources including an accomplished faculty, forward-thinking students pursuing degrees in more than 90 majors, a media center, and OWU’s innovative Woltemade Center for Economics, Business and Entrepreneurship. Delaware County is recognized routinely as one of Ohio’s fastest-growing and finest communities, with low unemployment, strong schools, and a desirable quality of life. SmartAssets.com named Delaware as Ohio’s No. 1 county in 2017 for incoming investments in business, real estate, government, and the local economy. More information about entrepreneurship in the county – including Enterprise Zones (EZ), Community Reinvestment Areas (CRA), and Tax Increment Financing (TIF) – is available from the Delaware County Economic Development Office. The City of Delaware has been recognized by Money Magazine as one of the “100 Best Places to Live in America” and by WalletHub.com for being in the 70th percentile of America’s best small cities based on economic health, affordability, quality of life, safety, and education and health. 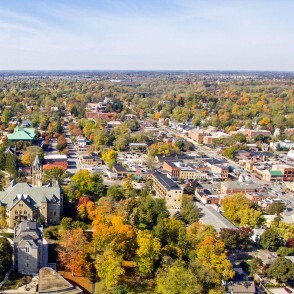 The city’s historic downtown – steps away from OWU’s campus – offers a wide variety of shopping and dining as well as seasonal farmers’ markets and monthly “First Friday” celebrations. More information about entrepreneurship and business-building – all with the help of the city's dedicated “business concierges” – is available from the City of Delaware Economic Development Office.